Pakistani military ruler President Pervez Musharraf said on Thursday he would be willing to meet Opposition leader-in-exile Benazir Bhutto to advance rapprochement with liberal forces, but not yet. The Supreme Court on Wednesday dismissed all petitions challenging the 17th Constitutional Amendment and the dual office of President Gen Pervez Musharraf. However, a decision in a case relating to the retirement age of the superior court judges was withheld. Twin suicide car bombs killed at least 15 persons during the morning rush hour in central Baghdad yesterday, cutting short what had appeared to be a lull in violence since landmark elections in January. Paris, April 14 Astronomers say they have identified a place on the Moon that lies in permanent sunlight and close to regions suspected to hold water: in short, an ideal location for a tentative lunar colony. A Food and Drug Administration advisory panel recommended on Wednesday that silicone gel implants made by Mentor Corp be allowed back on the market for wider use — a surprise decision that came a day after the same panel rejected the application of a rival company. General Musharraf told Reuters Ms Bhutto’s Pakistan People’s Party was not helping reconciliation by planning rallies this Saturday to welcome back her husband, Mr Asif Ali Zardari, from a visit to her in exile in Dubai. “Moderate forces need to unite to suppress the extremist forces,” he said in an interview when asked about reconciliation with liberal parties such as Ms Bhutto’s. “This is what I think is extremely important from the national perspective.” “Within this, any kind of talks or negotiations or rapprochement, one would be willing to do,” he said. “That time has not come as yet; when the time comes, yes, one doesn’t mind meeting anyone. “But at the moment it’s not right at all, especially with whatever is happening now,” he said referring to the PPP’s rally plans in the eastern city of Lahore, which the party says authorities have tried to block by arresting thousands of supporters. “The attempt to disturb law and order in Lahore on the 16th is not conducive to good, harmonious relations,” said General Musharraf, who is due to leave for India that day in an attempt to move forward a slow-moving peace process. Authorities have effectively barred the PPP from holding a rally in Lahore to welcome Mr Zardari by extending a temporary ban on gatherings of more than three persons. 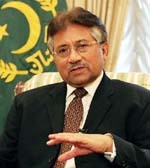 Asked why authorities nevertheless let the Muttahida Majlis-e-Amal, a six-party alliance of religious parties that have traditionally supported the military, to hold anti-government rallies across Pakistan in recent months, General Musharraf said those gatherings were more orderly. Ms Bhutto, Prime Minister for two terms in the 1980s and 1990s, has lived in self-imposed exile for fear of arrest on corruption charges since 1999 and General Musharraf has in the past said she would not be allowed to return to politics. However, apparently seeking to bolster his power base and respond to Western cities pushing him to lift curbs on democracy, he has softened his position in recent months. Officials say behind-the-scene talks have taken place between Ms Bhutto and the General’s aides to discuss a rapprochement with politicians sidelined since he seized power in 1999 coup, but little concrete progress has been seen. Mr Zardari was released from prison on bail in November after eight years in jail on charges ranging from corruption to murder and his release raised speculation General Musharraf might try to improve relations with Ms Bhutto’s party. The latest detentions of PPP activists have come as the Cabinet approved legal reforms on Wednesday, which Ms Bhutto’s lawyer said could allow her return from exile. The draft reforms, aimed at making justice more transparent, include proposals to give women the automatic right to bail, except in cases of murder, terrorism, narcotics or robbery. “For reasons to be recorded later, all petitions are dismissed, but petition No 12/2004 is being de-linked to be heard separately,” Chief Justice Nazim Hussain Siddiqui announced in a unanimous short order. Led by the Chief Justice, a five-member bench comprising Justice Iftikhar Mohammad Chaudhry, Justice Javed Iqbal, Justice Abdul Hameed Dogar and Justice Faqir Mohammad Khokhar concluded the hearing on seven petitions. After the hearing, the bench retired for a while to come back and announce the short order at 1:45 pm. A third blast went off several hours later in the same area, killing one person, reporters at the scene said. They said the explosion appeared to have been remotely detonated. Earlier, security officials had described it as a controlled blast. The suicide bombs detonated in quick succession near an Interior Ministry building on a crowded street, destroying 15 cars and scattering debris over a wide area, witnesses said. An Interior Ministry official said at least 15 persons, including children, were killed and the death toll could rise. Officials at nearby hospitals reported more than 30 wounded. Police officer Abbas Khudier was riding in a nine-car police convoy making its way through a traffic jam when the blasts went off. He said he thought the bombers had targeted his convoy. ‘’We were cutting through the traffic when a car in the middle of the street blew up,’’ he said. Casualties from the first blast were worse because the bomb went off in the middle of blocked traffic. Al-Qaida in Iraq, a group led by Jordanian militant Abu Musab al-Zarqawi, claimed responsibility for two of the blasts in a statement posted on the Internet. Astronomers say they have identified a place on the Moon that lies in permanent sunlight and close to regions suspected to hold water: in short, an ideal location for a tentative lunar colony. The spot is located on a highland close to the lunar North Pole, between three large impact craters called Peary, Hermite and Rozhdestvensky, the report in today’s issue of Nature, the British weekly science journal, said. The temperature there is estimated to range between minus 40° and minus 60° C which by lunar standards is relatively balmy-and stable. By comparison, the temperature on the Moon’s equator ranges from minus 180° C to plus 100° C.
Because the area is bathed in perpetual sunlight, a future human outpost on the Moon could draw on abundant solar energy. In addition, the lunar pioneers could tap into supplies of water if-as some scientists speculate-ice lurks in permanently shadowed craters at the lunar poles. The panel voted seven to two in favour of lifting the 13-year-old partial ban on the controversial implants, but it also recommended that the company be required to meet nine tough conditions.